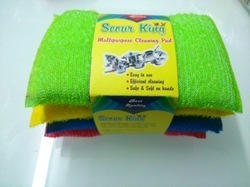 Kibble SPONGE is a high density sponge for kitchen counter cleaning, washing glasses or cleaning of cars. We are offering Willson Sponge Kit to our clients. We introduce our business as a noteworthy organization of qualitative array of Polyester Scrubber. Backed by the rich industry experience, we are engaged in providing superior quality Sponge & Scrubber. To fit the exact desires of customers, we are engrossed in delivering optimum grade Kitchen Cleaning Sponge as per the detailed stipulations of clients. Designed to easily clean pots and pans, Better Sponge will be your handy cleaning go-to tool. With a non-slip grip, the built-in suction cup provides easy storage and the soft bristles gently and effectively get your dishes clean. Bacteria & mildew resistant, easy to clean, dishwasher safe. The last sponge you will ever want! In order to suit the various needs of our esteemed clients, our enterprise is dedicatedly engaged in providing 2 in 1 Sponge in the market. Material: plastic handle with powerful sponge Idea for Cleaning Sink, Bathroom, Pool, Floor Tile, Boat Decks, Utensils etc. Length x Breadth : 14 x 9 cms Color will be sent as per stock availability. 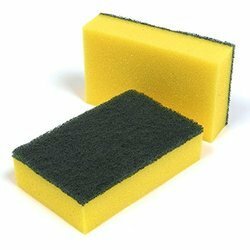 With consistent obligation towards excellence, we are readily engrossed in offering a wide gamut of Kitchen sponge . Double-sided sponge, with nail-protecting design. High-quality product. Sponge Wipe : 1, 3 & 5 Pcs.